While IFTTT is a great tool for social media automation and lots of everyday life stuff, here at Seer, we believed it was capable of much, much more. So we had a handful of hackathons and a whole lot of testing to come up with some brand-spanking new IFTTT recipes (now called “applets“) that will help you gather marketing intelligence and make strategic decisions for your brand. Most of the applets that we’ve prepared here require a bit of pre-IFTTT prep. Here are two valuable tools that you’ll see used over and over again in these applets. Visual Ping: This tool will notify you when there is a visual change on a website, web page, or even just a area of a web page. 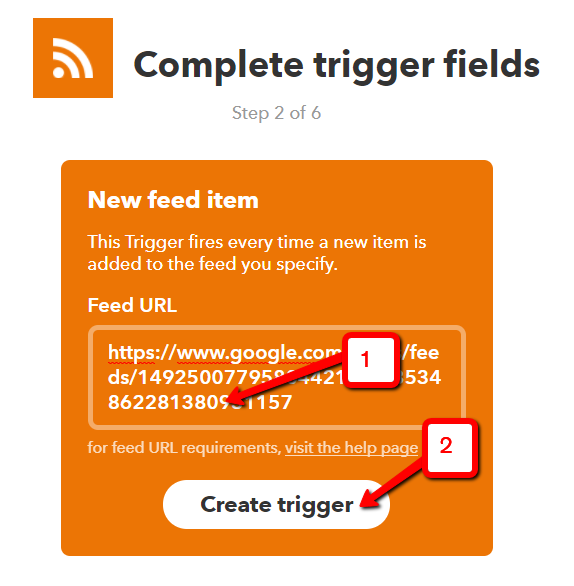 Page2RSS: This tool will convert any web page – even if the page doesn’t publish a feed of its own – to an RSS feed, so that you can easily subscribe. Almost all of the THAT steps in our applets below are means of notification. When writing these applets, we selected what we thought were the most applicable forms of notification, but you should select whichever works best for you. It basically comes down to how quickly you’d like to be notified. For example, if your site has been hacked, you’ll want to know ASAP, so you’ll probably want your alert to be a text message/SMS. For something that you want to keep track of every day, an email might be the best notification for you. If it’s something that you’ll want to check on maybe once a week or once a month, have the results archived in Evernote or a Google Doc. In general, tailor these applets to what works best for you! Check out all of the marketing opportunities below, and if you have any suggestions, whether they’ve been tested or untested, share them in the comments below – we’d be happy to add them to our list and give you credit! So, what do you want to do with IFTTT? WHAT IT MEANS: Archive and organize emails from your competition for future analysis, without clogging up your inbox. Subscribe to emails from all of your competitors to a Gmail address. Create filters in your email to automatically archive the emails and mark them as read. Create a Note – in whichever notebook you specify. Now, all competitor emails will be archived in Evernote for your future perusal and analysis. Sign up for an account on Newsle.com (you need a LinkedIn account to do so). Sign up for Newsle emails, so that you get regular reports on when your LinkedIn contacts are mentioned in the news. Now, you’ll have Newsle mentions saved in a Google doc for reference. WHAT IT MEANS: Keep track of the changes that your competitors make to their websites. Use VisualPing.io to monitor a competitors’ web page. Set the timing and type of change to whatever you like, and add your email address for notification. WHAT IT MEANS: Stay on top of what your competitors are blogging about, and archive the posts. Subscribe to the blog’s RSS feed. Now, you’ll get an email every time there is a new blog post on the competition’s blog. Choose whichever metric you’d like – price at close, price rises above, price drops below,etc. Now, you’ll get an email every time the stock price moves. WHAT IT MEANS: Keep a close eye on the C-level employees at your competition. Set Google Alerts for executives’ names along with negative keywords (e.g. “stole” or “fired”) and subscribe to RSS alerts. Now, you’ll get an email every time one of these executives is mentioned online. WHAT IT MEANS: Get notified every time one of your competitors creates and shares a new YouTube video. Now, you’ll have YouTube videos saved in a Google doc for reference. WHAT IT MEANS: Get a text message any time your competition is using a new software tool on their website. You will now get a text message every time your competitor adds new software to their website. Search for your competitors’ website(s) on Moz’s Open Site Explorer. Go to Page2RSS.com and paste your URL. This will create an RSS feed of just discovered sites. You will now get an email alert every time a new site links to your competitors’. You will now get a text message every time your competitor updates their online asset. WHAT IT MEANS: This applet will help to monitor your competitor’s “New Arrivals” page and issue you an email alert if a change on this page had occurred. Now you will be able to see any changes that have been made your competitor’s page. WHAT IT MEANS: Create an RSS feed for competitors’ XML sitemaps and monitor any changes they make. Now you will receive an email notification for any changes in your competitor’s XML sitemap. WHAT IT MEANS: Monitor brand of competitor Wiki pages for updates or changes. Use Page2RSS to create Wiki profile feeds (e.g. http://en.wikipedia.org/wiki/SEER_Interactive ). WHAT IT MEANS: Monitor Twitter for negative comments about competitors and proactively reach out and offer help. Use Twitter Advanced Search and search for queries like, “worst” OR “terrible” OR “awful” AND “[competitor]”. Then use Page2RSS to create a feed from this Twitter link. THIS Service: Feed then ‘New Feed Item From’ Page2RSS Link. Repeat for as many competitors as needed and set up filters in your inbox to organize these messages. 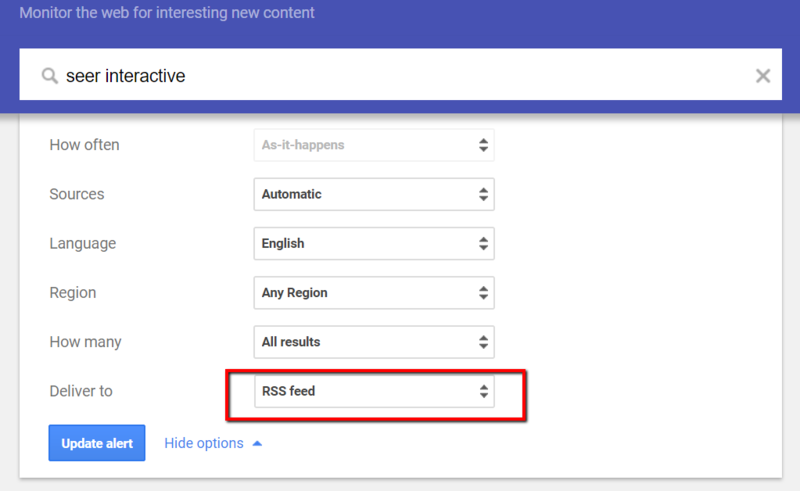 WHAT IT MEANS: Get RSS from Google News using Advanced News to track releases and news from competitors. Use the Advanced News feature for Google News to target the competitor or target you want to monitor. For example: [ allintext:”Staples” OR “Staples Inc.” ]. THIS Service: Feed and ‘New Feed Item’. 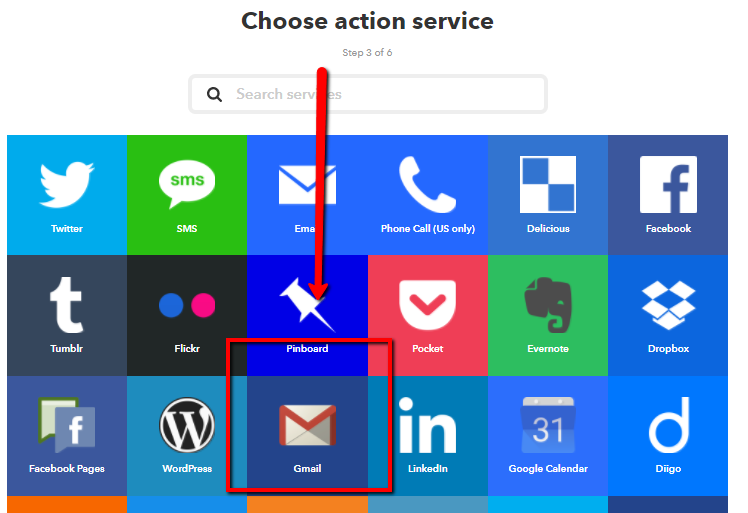 THAT Service: Gmail or Email to email address of choice. Repeat and modify these searches for competitors and topics. You will now get email updates every time a competitor or topic of interest breaks news. WHAT IT MEANS: Receive alerts when a competitor launches a new Android App. Search for your competitor’s brand name in Adrolib.com and convert the link to your RSS feed using Page2Rss.com. Now you can stay up to date on new Android Apps that your competitors release. WHAT IT MEANS: Know when your competitors’ IPs or DNS servers change, or when they build a new site on the same server. Search for your competitors’ domain on SpyOnWeb.com. Turn the results URL (e.g. http://spyonweb.com/seerinteractive.com) into an RSS feed using Page2RSS.com. Now you will be notified when your competitors make a change to their website or server. Repeat for any relevant keywords or phrases. Now, you’ll get an email any time someone posts in that subreddit about something relevant to your brand or industry. WHAT IT MEANS: Get an alert when there is a relevant PR opportunity for your brand without having to read through several long daily emails. Sign up for email alerts from HARO and ProfNet. Have them sent to a Gmail address. Repeat for each relevant term. You will now get an email alert for every new relevant PR query about your industry or brand. You will now get an email alert every time a Google trend matches your industry keyword. WHAT IT MEANS: This applet will create a Google spreadsheet to keep track of a specific hashtag from Twitter. Search for your hashtag in Twitter (e.g. “#SEO) then copy the link into Page2Rss to convert the link into RSS format. Now you will have a Google spreadsheet that will keep record of all the times that this hashtag appears on Twitter. WHAT IT MEANS: This will notify you when a video with certain keywords is launched and search in all YouTube channels. Repeat for various queries and Google Alerts. Now you will be able to monitor and record new video launches in your Google Drive. WHAT IT MEANS: Get notifications when a particular twitter handle asks a question or would use a phrase like “for a story” or “let me know”. This can be a good way to leverage journalistic opportunities. THAT Service: Email or Gmail. Now you will get an email every time there is journalist asking for help on a story. WHAT IT MEANS: Find opportunities with journalists by monitoring questions they ask on Quora. Now you can find opportunities instantly with email notifications when a reporter of interest updates their Quora profile. WHAT IT MEANS: Get an alert when a new website links to yours without having to manually check on a regular basis. Search for your website or page on Moz’s Open Site Explorer. You will now get an email alert every time a new site links to yours. WHAT IT MEANS: Archive weather reports on a daily basis. If your brand is affected by the weather or seasons, you can check old reports to determine if and how the weather affected performance on any given day. Track weather using IFTTT’s weather feature. Now, you’ll be able to check your Google spreadsheet to find out what the weather was on any given day. WHAT IT MEANS: Find Instagram photos tagged at your business location to identify potential influencer partnerships. Now, you’ll get an email every time a new Instagram photo is tagged at your location. WHAT IT MEANS: Find important Pinterest influencers by seeing which users are pinning from your website – or from your competition. Now, you’ll get an email every time there is a new pin from your site. WHAT IT MEANS: Get an alert as soon as your client changes their robots.txt so ensure that no dangerous changes are being made. WHAT IT MEANS: Keep an eye on TripAdvisor to see who is talking about you and your competitors, and what they are saying. Now, you’ll get an email every time there is a new review on the TripAdvisor profile. Go to Page2RSS.com and paste your URL. This will create an RSS feed of Flickr photos. You will now get an email alert every time a new Flickr photo is tagged with your brand or industry. WHAT IT MEANS: See which other sites are hosting your images so that you can contact them for a link. You will now get an email every time your image shows up on another website. WHAT IT MEANS: Use VisualPing.io to monitor google SERP changes for a specfic query and keep a record of these changes in a Google spreadsheet. Sign up for Visual Ping and take a screenshot of the SERP results you want to track. Then sign up for the email alert from VisualPing. THAT Service: Google Docs and ‘Add row to spreadsheet’. Repeat for all relevant searches. WHAT IT MEANS: Don’t miss a tweet when you use Twilert or Warble to track specific tweets, inquiries or topics and filter them from your email into a spreadsheet using IFTTT. Using Twilert.com or Warble.co, use advanced operators to search Twitter. (e.g. “algorithm update” AND “@MattCutts”). Repeat for as many topics you’re interested in receiving alerts on. Now you will be receive and be able to keep track of the tweets you want to monitor. WHAT IT MEANS: Get a text message when your site has been hacked by setting up an alert for common spam keywords. Now you will receive a text message alert when your site has been hacked. WHAT IT MEANS: Have a GoogleDoc spreadsheet to keep track of Keep.com product search results. Search for your wanted topic in Keep.com’s onsite search bar. (e.g. black heels) Copy the link of your search results and use Page2Rss to create an RSS feed. THIS Service: Feed and ‘New Feed Item’ and insert the Page2RSS converted link. Now you will be able to track new items in Keep.com searches as they happen. WHAT IT MEANS: Monitor to see when your pages gain rich snippets in SERPs. Setup a Visualping.io notifiation or the SERP page where your listing exists. THAT Service: Google Doc then ‘Add Row to Spreadsheet’. Repeat for multiple SERPS and modify the Drive folder path for to organize for multiple SERPs. WHAT IT MEANS: Create an RSS feed for competitor’s Yelp pages and monitor their reviews. Then highlight the reviews section of the page and adjust notification settings. Repeat and modify the Drive Folder path for different competitors. Now you will be able to monitor you competitor’s Yelp reviews and keep a record of them in a spreadsheet. WHAT IT MEANS: Keep an eye on Tumblr to see how is posting about your brand or industry. Do a search on Tumblr for a topic and grab the URL (e.g. http://www.tumblr.com/search/seo). 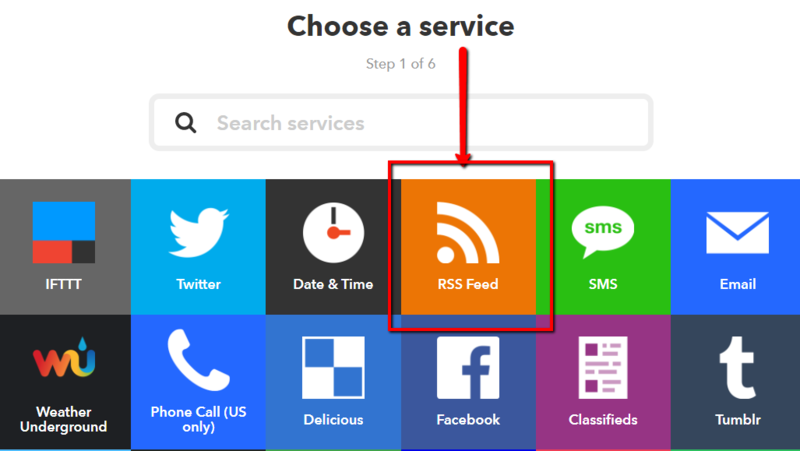 Turn that URL into an RSS feed using Page2RSS. Now you will be able to monitor and archive all mentions of your brand or industry on Tumblr. WHAT IT MEANS: IceRocket can monitor mentions of your brand on blogs and social media. Enter YOURBRAND.icerocket.com into your browser (e.g. http://seer-interactive.icerocket.com/) Turn that URL into an RSS feed using Page2RSS. WHAT IT MEANS: If you participate in weekly industry Twitter chats (i.e. #ppcchat or #seochat), get a reminder when it’s time to join up. Find out what time these chats start every week. Now, you’ll get a text message whenever it’s time to participate in one of your regular Twitter chats. Now, you’ll get an email any time a new resume containing your keyword is posted to your local Craigslist resume section. WHAT IT MEANS: Stay on top of any changes that Google makes to their content guidelines. Now, you’ll get an email every time Google updates one of the pages in their content guidelines. WHAT IT MEANS: Stay up to date on opportunities by setting up alerts for a CMO/CEO/etc..
Now you will be able to keep track of all Google Alert Updates from your person or company of interest. WHAT IT MEANS: Get a notification of when an industry meetup is occurring. Now you’ll get an email every time a new industry meetup is added. WHAT IT MEANS: Get a notification of when an industry webinar is occurring. Now you’ll get an email every time a new industry webinar is added. It’s pretty simple. IFTTT uses what it calls “applets” to automate tasks. Each applet has a THIS channel and a THAT channel. When the THIS channel is activated, it triggers the THAT channel to take action. If THIS, then THAT = IFTTT. IFTTT is a very intuitive site, but let’s walk through setting up one simple applet – having Google Alerts sent to your email. 1. There’s some pre-IFTTT setup to do first (as there are in most of our applets). After hitting “Create Alert,” you’ll see this screen. Right-click on the “Feed” link and copy the URL of the feed. 2. Now it’s IFTTT time! 3. Then, click on “this” to select your THIS channel. 4. Choose your THIS channel/service. 5. 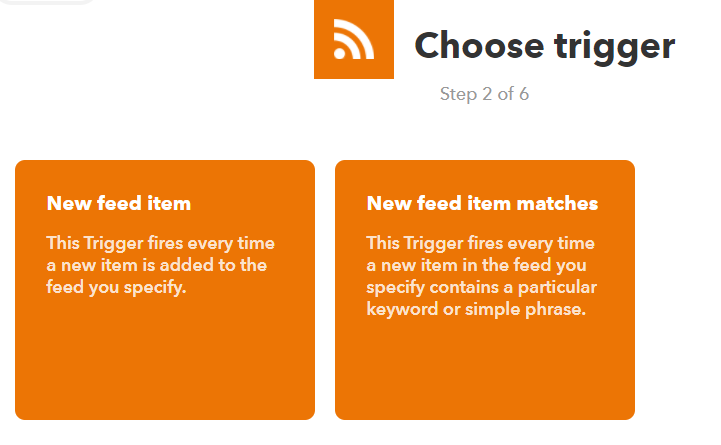 Now, IFTTT will ask you to choose a trigger. Do you want to be notified every time there’s a new item in the feed, or just when an item matches a certain keyword or phrase? Select whatever will best fit your needs, although choosing “New Feed Item” will bring you more results. 8. Now, it’s time to select your action service. This can be whichever notification medium that you’d like to use. If you want up to the minute notifications, you could select SMS. If you want to archive the notifications to review them at a later time, select Evernote or Google Drive. In this instance, we’re going to choose our email – specifically, Gmail. 9. Now, you’re choosing an action. Decide what you’d like to do with these emails. In this case, I’ll send the alerts to myself and to some others. 10. Choose your email address(es). 11. Confirm and activate by clicking “Finish”. 12. And you’re all set! Your applet should now trigger and send you an email whenever a new Google Alert from Seer Interactive shows up. Still need some clarification? Read all about how IFTTT works in their own words.